Although the pot's been on the burner for a number of months, the water hasn't reached the boiling point. We're still in the early rounds of the Fast Food Wars. Round One was the lead-up to the tipping point. You could argue this has been building for years. However without catalysts, the status quo remains. But it looks like this movement has some legs and could go many rounds. The fight could last for years. It could get ugly. I've listed some of the important factors leading to these protests, quickly gaining momentum around the country. Round One brought about the initial action. Round Two is characterized by growth as the movement spreads geographically and awakening as the various stakeholders perk up and coalesce along traditional labor/management lines. We're at this point right now. So what does all this have to do with Job Search? In a nutshell, Free Agency - actually, anti-Free Agency. The concept which I embrace and use daily states that all American workers (including management) are in fact Free Agents independently operating in the Marketplace. 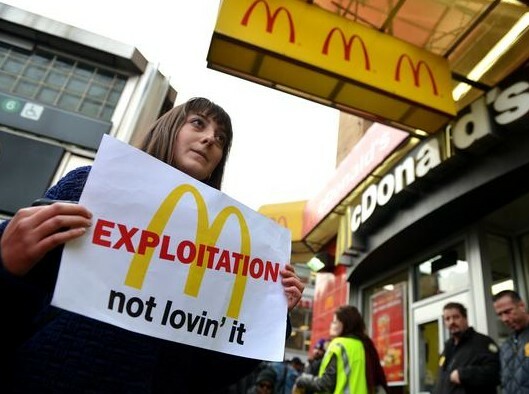 Every single fast food worker is, at the end of the shift, still a Free Agent. There's danger for those asleep to this idea. Getting caught up in what's happening and yet to come on the ground, can result in continued and ever deeper unconsciousness regarding their own personal situation. This movement is built around two key labor demands, 1) the ability to organize 2) an increase in wages (asking amount = $15/hr). Incredibly powerful and invested players are circling just under the surface. There are complicating issues that will have an impact on how this plays out (such as the Affordable Care Act). Make no mistake, this has the potential of becoming a really big and protracted story. Nonetheless, the question for most workers is the same - how will this impact me in the near term? Whatever the outcome, it won't come about quickly. Therefore, what's going to happen in the short run? Who's to say, however things might get worse. I find the current state of affairs deplorable on many levels. I am concerned for the future of the Middle Class as I am for those trying to get there. I know that continued (and growing) wage and standard of living inequality are not sustainable. And yet, in the near term, I hope that each worker impacted sees themselves for what they really are, Independent Free Agents. I hope they get what the Marketplace (if it had opinions and feelings) would instruct, that the process of collectivization does not or should not replace the requirement for each individual to think, plan, and act for themselves.